You’re almost ready. The aluminum bleachers, in the layout and design that you want for your venue, are all planned. Visualization of the completed project brings a smile to your face. Reflecting in the sun, those shiny new aluminum bleachers are definitely going to be an attention getter. Some sections are even going to have the team colors integrated in them with custom bleacher covers. You can see it now, bleachers full of crazed fans, standing, jumping, and cheering the team on. The atmosphere at the games is going to be electric, and you can hardly wait. But hold on there champ. 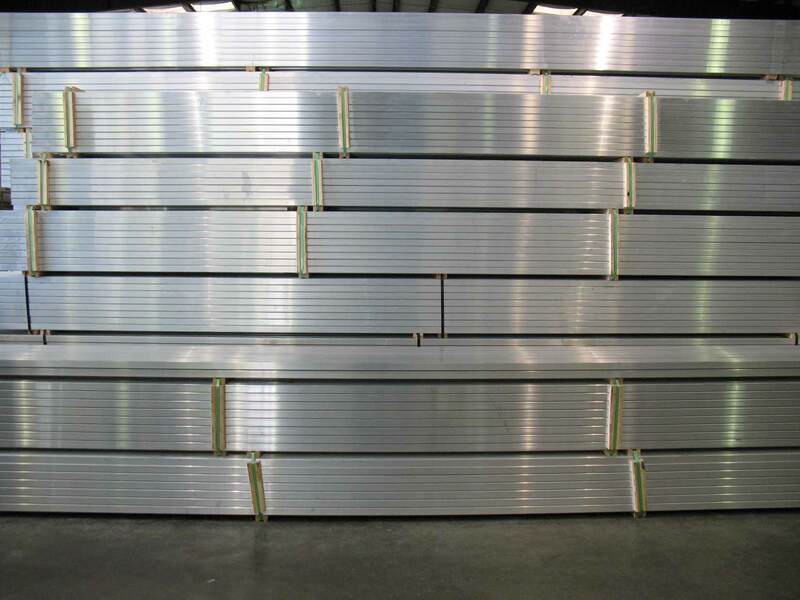 Aluminum bleachers contain a myriad of connecting, interlocking, matched parts, precisely designed and manufactured for your specific needs and conditions. So while it’s a good idea to install or replace your current, aged bleachers with new, long lasting, low maintenance, aluminum bleachers, there are also decisions to be made and specifications to be met with respect to regulations and codes in your area. So go ahead, close your eyes, visualize your shiny new aluminum bleachers being loaded with screaming, frenzied fans, cheering on the team that they are so in love with, but first, make sure you cover your bases and ensure the safety of those fans by checking and complying with the important measures laid out in the International Code Council and International Building Code specifications, and mandates in addition to your state and local building codes. First and foremost on your list of things to do should be a complete, connection-by-connection inspection of the new bleacher build and installation. If you’re considering a retrofit situation, an inspection like this should be completed upfront to identify the areas that need to be updated and repaired. Besides being a good business practice, compliance with the mandated yearly inspection may be a law in your state, and will also provide advance notice as to any components or structural issues that may compromise overall structure integrity, such as excessive wear and tear, cracked welds, or missing connection devices. Elevated aluminum bleachers with steps. All parts must fit properly to ensure spectator safety. Of course the most important element is safety. Safety is the reason for these codes and regulations. With a history of injuries, including fatalities, bleacher safety came to the forefront in the late 1990’s, and is now the driving force behind the ICC codes. Structural integrity must be met with respect to weight and occupancy limits. 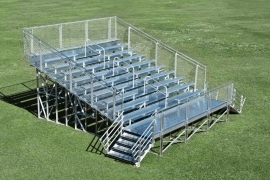 Telescoping bleachers must only be used in the proper position, meaning all the way extended. The floor underneath those rolling or telescoping bleachers must be designed to support the rolling load movement of those bleachers. Regular inspections must include damage checks, safety checks, and close, connecting point review to eliminate sharp edges, pinch points, cracked welds, oversized gaps, and excessive wear. When designing your aluminum bleachers, you must incorporate allowances and provide calculations for live, dead, wind and snow loads on the structure. These calculations must also take into account material strength, load duration, unbalanced, moving, or changing loads (Crowd movement, unified stomping, etc). Foundation design is now specified depending on geographic location. Proper footings set into proper groundwork, with the recommended structural attachments to that groundwork, are required in order to prevent tipping, uplift and overturning. Sanitation Practices. Toilet facilities should be within 500 feet of the bleachers, and be readily accessible, including family and ambulatory accessible facilities whenever 6 or more male and female units are required, based on occupancy. Fire and Safety Systems. Fire barriers are to be installed where specified. Fire barriers are needed for under-bleacher areas that are not ticket booths or toilet facilities. They may be mandated between the bleachers and storage sheds housing landscape equipment or flammable materials. Sprinkler systems are mandated based on occupancy of bleacher areas, and separately enclosed press boxes and storage areas. Fire systems for seating areas in excess of 15000 seats defer to the local building code requirements. The paths leading to and marking entrance and exit points should be illuminated for easy viewing, and contrasting strips are to be installed on stair treads at their leading edge. Bleacher stairs and any walkways are to be designed to shed water for safety. The bleachers must have wheelchair accessible seating on the main level, and then also on at least one of each two additional levels. There should be wheelchair spaces dispersed at the point of entry to the bleachers, and may be cut into the bleacher seating for mobility devices to fit. Designated aisle seats should make up at least 5 percent of the total seating. Aisles, entrance and exit points must be designed with adequate width in relation to occupancy and designation as either a smoke-protected or non smoke-protected space. Occupancy limits must be posted in plain view for both indoor and outdoor bleacher seating. Press boxes may have to have their own specific access and exit points. But what if you already have aluminum bleachers, or you’re purchasing a used system from another source, and simply looking for a retrofit. You’re still responsible for providing fans and other users a safe, code compliant place to gather and enjoy themselves. In this case, you’re looking for a quality retrofitting process that will bring your out of date, out of compliance aluminum bleachers up to code and compliance. You are responsible for the public’s health, safety, and welfare. We know that falls are the biggest hazard to bleacher fans, especially children. Falls occur because of missing components, inadequate access and exit points, or improperly installed or maintained aisles, stairs, and handrails. 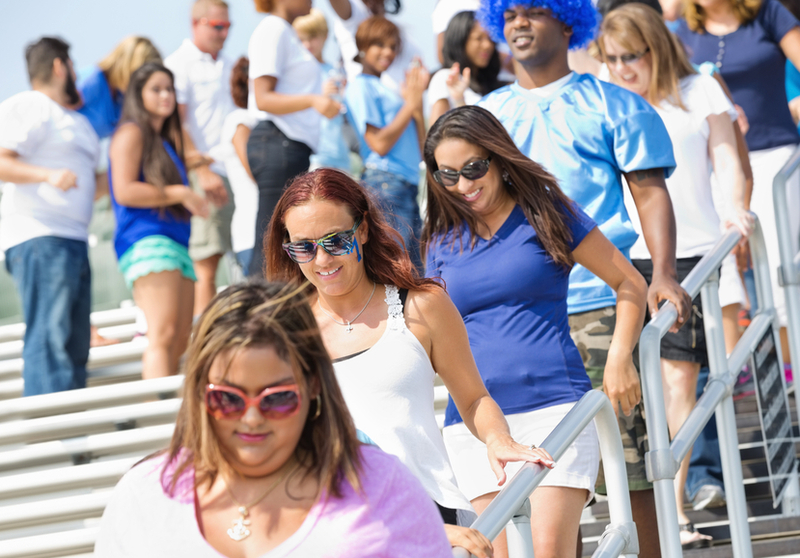 By following these retrofit strategies, you can achieve compliance and make your bleachers safe and accessible to everyone. Simply add school colors with colorful bleacher vinyl covers. Perform a detailed inspection to identify your specific needs with respect to public safety, health, and welfare. This can be the responsibility of venue owners and operators, park and recreation officials, school or university officials, the manufacturers themselves, designers, licensed inspectors, or other regulatory officials. Where needed, bleacher guard rails must be 3 ½ feet high and enclose all seating and aisles higher than 30 inches, measured from the floorboard. This can be done several ways, including vertical or horizontal guards, or chain-link. If enclosing with chain-link, it must be made of mesh measuring 1 ¼ inch square or less to discourage climbing. Proper handrails, easy access aisles, non-slip surfaces, and ADA accessibility must all be taken into consideration during your retrofit. As with new aluminum bleachers, the bleachers in place must be resistant to movement, sway, and load shift. It is recommended that oversized openings be blocked by rigid, aluminum extruded products or grating material to reduce falls, trips, and the collection of any debris that may contribute to unsafe conditions and unsanitary practices. So, you’re all set. Your visions of cheering, stomping, raucous fans are inching closer to reality. You can’t wait for the first game of the season. But now, you can confidently smile about that scenario, because you took the time to make sure that those fans will have a game to remember, with bleachers that are safe for them, their friends, and family. Bleachers that you made sure are ICC Code complaint.